Hawley Bowlus was a true icon of the Golden Age of soaring. His efforts in glider design dominated in 1911-1929 when he built a series of fifteen gliders of his own design and construction. During World War I, Bowlus served in the United States Air Service in Europe (1917-1920). Soon after, Bowlus was hired by the Ryan Aircraft Company to fly the powered Cloudster biplane between San Diego and Los Angeles for the first scheduled airline in the United States. In 1927, he worked for Ryan as Superintendent of Construction for Lindbergh's Spirit of St. Louis. After this, he built his 16th glider, a very lightweight design capable of sustained soaring. This aircraft, called the Paperwing, was one of if not the first sailplane of American design and construction and was one of the first gliders to receive a U.S. Identification mark. During 1929-1930, Bowlus established numerous American soaring endurance records at Point Loma, San Diego, California, with the Paperwing and other further refined sailplane designs. These flights took the American duration mark from 15 minutes to over 9 hours. Bowlus established one of the first glider schools in the U.S., and one of his students, Jack Barstow, soared for over 15 hours in a Bowlus sailplane in 1930 to establish an unofficial world record for glider endurance. (Another Bowlus-derived sailplane, the Nighthawk, was used in Hawaii to establish a world record soaring endurance of 21 hours, 34 minutes in December of 1931.) Bowlus trained both Charles and Anne Lindbergh to fly in Bowlus sailplanes at San Diego in 1930. Nine of the first ten licensed glider pilots in the U.S. were graduates of the Bowlus Glider School. Bowlus also established the Bowlus Sailplane Company in 1930, selling gliders nationwide. He proceeded to tour the nation, soaring at locations in Michigan and New York. 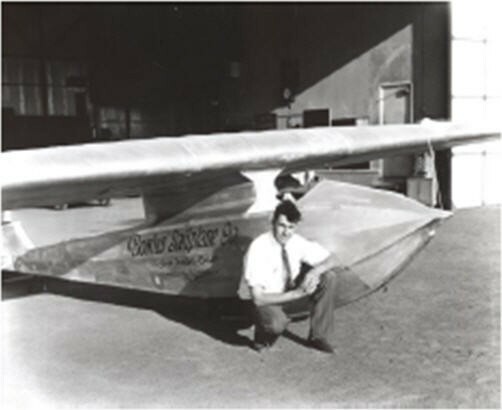 His records and achievements led to significant and positive popular press for soaring, and Bowlus helped in the establishment of the National Glider Association as well as the Bowlus Glider Club, Anne Lindbergh Glider Cubs, and Associated Glider Clubs of Southern California. During the early-to-mid 1930s, Bowlus teamed up with other soaring notables such as Martin Schempp, Richard du Pont, and others to develop sailplanes, such as the Senior Albatross I and Senior Albatross II. These sailplanes, produced by the Bowlus-du Pont Sailplane Company were also used by American pilots for records and to win national championships. Bowlus designed the famous Baby Albatross sailplane in the mid 1930s, offering the glider as a popular less expensive kit for home construction. This design became a hallmark of American soaring in the period.mid 1930s, offering the glider as a popular less expensive kit for home construction. This design became a hallmark of American soaring in the period. During World War II, Bowlus became associated with the Douglas Aircraft Company, designing and test flying military training and transport gliders. These included the Bowlus XCG-7, XCG-8, and XCG-16. A tragic accident with a prototype XCG-16 led to the deaths of soaring pilots Richard du Pont and Howard Morrison at March Field in southern California. Bowlus pursued very diverse interests throughout his life, many of which revolved around applications of aerodynamics in new disciplines. For instance, his streamlined Bowlus Road Chief is credited as the first recreational vehicle that led to the more famous AirStream trailer. Bowlus also enjoyed large scale model trains. His last soaring flight occurred August 12, 1967 at Pearblossom, California. Shortly thereafter he passed while working on a motorboat. During that period of his life he was helping Lear develop the prototype to what would become the famous Lear executive jet. Bowlus was never far removed from aviation. For his numerous accomplishments and tremendous love of all things soaring, Bowlus was inducted as a member of the inaugural class of the United States Soaring Hall of Fame in 1954. He etched an indelible mark on the history of American soaring.